Way back in the older days of technology, we didn’t really need all the tools for upgrading, building, and repairing our PCs, or any other tech gadgets. If you had a couple of screwdrivers, a nut driver, and a wrist strap with you, you’d be ready to work on almost every technical issue out there. But in this day and age, things got a lot more complicated than anyone would have expected. The way computers, monitors, coolers, and smart devices are made today makes it nearly impossible to work on some of the devices without having to use specialized tools. These items can either crack open a case or extract a portion of the item without you physically damaging it. Generally, finding a kit with all the necessary tools in it for efficient and quick work can be really challenging. But if you do find one, it almost always costs a fortune which isn’t really a good thing especially for our pockets. This is one reason why we’re always on the lookout for the latest equipment and tools for such things. And of course, we’re aiming for these kits that are affordable and budget-friendly. Luckily, there is a tool kit available with these elements, and it’s the iFixit Pro Tech Toolkit. Of course, we decided to check it out and see if it’s something that people like us would need; plus, if the tools included here are sturdy and durable enough for a variety of tasks. 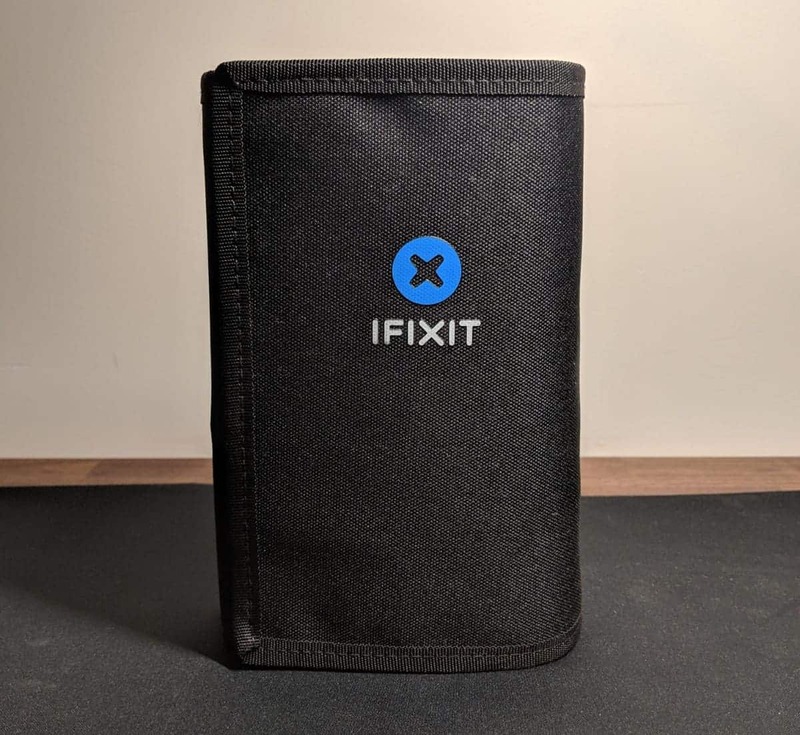 The Pro Tech Toolkit from iFixit comes in a durable and flexible ballistic nylon container that makes it feel just like a secure safecracking kit. It folds just the right size to hold all tools securely when you need to bring it around with you. Plus, it unfolds neatly to display its extensive collection of tools that are all placed nicely and neatly in their own strap or pocket. The heart of this tool kit is the 64-bit driver set that has its own plastic storage box that magnetically sticks to the nylon wrap. It’s basically your secret tool for opening any item that’s been screwed tight. The most important part of the iFixit Pro Tech Toolkit is how everything is kept neatly and compact. And when you open the kit, the very first thing you’ll notice is its carrying case and how all the important tools are presented. It was quite a surprise to us since we found pretty much everything that we needed in such a compact and handy package. Now inside the Pro Tech Toolkit, it comes nicely packed in a durable cloth wrap; and once you open this, you’ll immediately see the 64-bit driver tool set which is considered as the kit’s main highlight. It’s rugged and tough tri-fold canvas container was designed perfectly using high-quality materials, and it also sports an elastic band right along the screwdriver set. There are flaps present over all the tools to keep them in place; these also help prevent them from getting misplaced while in use, or when traveling. If you’re worried about everything falling out when you fold up the kit, don’t worry, that’s what the flaps are for – to keep everything in place; and as for the folded up kit, it closes and stays in place with the help of a Velcro tab. Once you open the magnetic lid, you’ll find the 64 screwdriver heads plus a flexible screwdriver extension which is vital for instances when you’re fixing hard to reach areas. Then, you’ll see the screwdriver which is, of course, made out of metal. It sports a rotating top so it’s extremely easy to use especially when you’re in a bit of a hurry with your task. All of the driver bits are magnetic which we think is really handy, especially when you’re dismantling gadgets like a smartphone since you won’t accidentally drop or lose the little screws it uses. What we really like about this driver set is that the lids sport grinds on them. This only means that you can utilize it as a screw organizer so you won’t have to worry about losing or misplacing your screws. When you take the whole 64 driver set off, you’ll find a removable magnetic plate which is great for keeping all the small parts in place and in an organized manner. Remember that everything present on this kit is magnetic and there are also no hinges present; plus, it is also easy to remove from the cloth wrap so you can conveniently take it with you without having to bring the wrap along with it. The tool roll measures 8.4 x 7.6 x 2.8 inches when folded; when it’s flat, its dimensions are 22 x 7.6 inches. It is made from polyester canvas and weighs a total of 1.88 pounds. The 4-millimeter bit material is made from 6150 steel, while the bit-driver material is made of anodized aluminum. For the bit-case, it is made of recycled ABS while its foam material is EVA. It’s quite interesting that the Pro Tech Toolkit also comes with a lifetime warranty, and if any tool in the kit breaks, iFixit will replace it, as long as you own and have the toolkit with you. In the primary portion of the kit, you’ll find a wide array of tools that will help you open or dismantle electronic devices and gadgets. Starting from the right to your left, you’ll find a metal jimmy which is made specifically for opening items that are tough. This can be used when tools like plastic picks and the like don’t work. However, you should avoid using this on devices like phones since it can highly damage the items. The metal spudger is designed for probing, scraping, and prying. Then, you have the plastic spudger that has a pointed end which can be used for precisely prying cables with. The other end of the plastic spudger is flat which lets you remove connectors carefully and with ease, so as to avoid damaging them in the process. You also have tweezers, three tweezers to be exact: one is the bunt tweezer that is made for delicate and accurate manipulations, the other is the angled tweezer which has tips that let you easily access hard to reach places. The last piece would be the reverse tweezers which you have to compress to open; then once you let go of it, it will stay closed. This type of tweezer will let you hold various components like cables, hands-free. What we liked about the tweezers is that they are made to be ESD-safe. Generally, the ESD precautions are important especially when you’re working with a variety of surface mount parts. Additionally, it also features an anti-static wrist strap to keep everything safe. Just above the tweezers, you’ll find the opening picks which are vital for getting or pulling the screens of your tablet or smartphones. It is also made using thin yet durable plastic. On the left-most portion of the flap, you’ll find a total of three blue tools for opening. These are generally useful for prying open screens while simultaneously letting you acquire more leverage on this. Above is a suction cup that lets you remove tablet or phone glass panels without leaving any scratch marks etc. And lastly, you’ll find the anti-static wrist strap; one end of it should be wrapped around your wrist before using the metallic clip to connect to another piece of metal that prevents any form of electrostatic discharge. These types of discharges usually damage devices while under repair. Aside from the tools that we’ve mentioned, the iFixit Pro Tech Toolkit also includes a knife and a metal ruler. The knife’s blade can be replaced while its dull portions can be easily removed whenever necessary. For the metal ruler, there really isn’t anything fancy or special about it, but it does give you distance conversions which you can find at the back of it. This can be really useful if you sometimes forget how to convert certain units of measurement. The company ensures that their toolkit is made only of the finest and the best to provide you with all of your repair needs. If you’re having troubles on how to fix something, iFixit will show you how through their guides and answers; plus, they also have tools and parts available to make repairs easier on your part. iFixit engineered the Pro Tech Toolkit at its finest – from its spudgers and custom opening tools to the company’s aluminum driver that features a swivel top and knurled handle. All the kits are made perfectly for all your repairing needs, so each of their kits features all the tools and parts that are necessary to complete the job. We’ve used a ton of toolkits in the past, but we really haven’t found something that’s useful and as versatile as the Pro Tech Toolkit. The tools included in this kit will let you open almost any type of device around; but the best thing about this is that they also offer you with device repair videos, as well as detailed instructions on how to use all the tools that are included in the kit. With that, you won’t have to wing it and worry about possibly breaking the device you’re supposedly repairing. Now for the tool’s quality, we can say that everything in the Pro Tech Toolkit is excellent. Its driver piece is aluminum-made and painted in black, and is accompanied by a nice-looking blue aluminum cap. The tip has a solid and sturdy magnet integrated so any little bolt that is present won’t fall off the driver. We think that this feature is extremely nice since we’ve already gone through moments of searching for really small bolts that we’ve accidentally dropped while doing repairs. It also uses most of the driver bits, as well as the special tools you’ll require to properly dismantle your devices. For the driver set’s cap, it also has an elevated internal grid to easily segregate and keep your bolts while working on certain devices. All in all, we think that the Pro Tech Toolkit from iFixit is a great tool kit, and we’d highly suggest this to you and others who do regular repairs. The Pro Tech Toolkit from iFixit is an outstanding toolkit and is great for anyone who needs to work on computers, smartphone devices, or any other repairs that require the use of screwdrivers and other important tools. iFixit made sure to include all the important and possible tools you might need for completing your repair tasks, and they sure did a great job in combining all the necessary pieces to make repair jobs quicker and easier. You can pickup the iFixit Pro Tech Toolkit for only $59.99 from the iFixit Store. For more information head on over to the iFixit product page.